This classic antique sign advertises the Delco battery. The sign is shaped like a Delco battery, viewed from a front 3/4 view. The battery is blue, and has six raised knobs and two terminals on the top. A blue ribbon hangs from the side that reads, “America’s No. 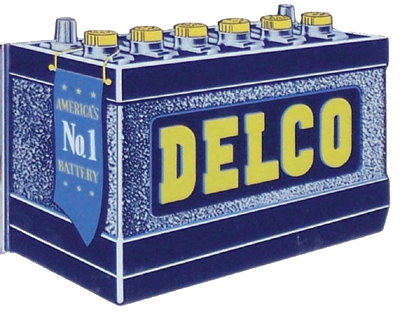 1 Battery.” The word “Delco” is printed in large yellow letters on the side of the battery.